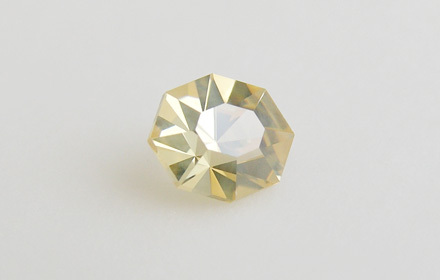 Weight: 0.39 ct; size: 4.21 | 3.58 | 2.47 mm; shape: oval; colour: light orangey yellow; strong; clarity: slightly included; cut: excellent; treatment: none. Slightly included specimen; design ‘Ovalimixtum ST 42-39’, excellent cut by Tan Pen. A component of contact metamorphic tactite; in high-temperature hydrothermal veins and greisen; less common in granite pegmatites and medium-temperature hydrothermal veins; alluvial (Anthony et al., 2001—2005). Very rare gemstone.